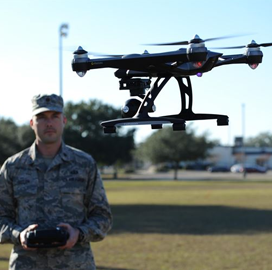 A Frost & Sullivan report predicts that Department of Defense spending on unmanned aerial systems will climb at a 4.6 percent compound annual growth rate over the next five fiscal years, National Defense Magazine reported Friday. The research company has projected the UAS market to reach $7B by FY 2023 and that small platforms will account for the largest percentage growth. Michael Blades, research director for North America at Frost & Sullivan, told the publication in an interview a demand for 24/7 intelligence collection technology can drive the projected growth rate. Blades added new payload technology such as data links, sensors and artificial intelligence systems have the potential to drive the UAS industry as DoD pursues manned-unmanned teaming and machine learning programs.